Island kitchen ventilation fan, as the name implies, is the ventilation solution that is suited for free standing kitchen islands. The island is now a familiar fixture of modern kitchens and it is preferred for its aesthetic value and functionality, as you can conveniently access it from all points like a standard kitchen table. The ventilation requirement is one of the major challenges of islands and you need to find the right island kitchen ventilation fan that can match the requirements of your modern kitchen without messing up its overall design. Kitchen islands would have been the top favorite of most homeowners if not for the challenges that it poses in the installation of kitchen ventilation systems. When planning to integrate an island in the design of your modern kitchen, it is important that you carefully consider the most appropriate island kitchen ventilation fan. Downdraft island kitchen ventilation fan is considered superior to its updraft counterpart in several aspects. It is normally preferred by homeowners as it does not generally intrude or affect the overall design of the modern kitchen. It is usually installed behind the cooktop, although there are instances where the island kitchen ventilation fan is incorporated into the kitchen appliance. This is the preferred option when you are facing potential problem of your sight lines being messed up by an overhead ventilation hood. Updraft island kitchen ventilation fan can be the logical choice if you are looking for the ventilation solution that can effectively handle a significant amount of stale and humid air as well as particulates that are generated in a busy kitchen. This type of kitchen ventilation fan is integrated into an overhead ventilation hood that connects through the ceiling and ducting of the home’s ventilation system. Since the kitchen ventilation system is exposed and highly visible from all points in the kitchen, you need to invest on a right material with the appropriate finish, and this makes it a more expensive option. 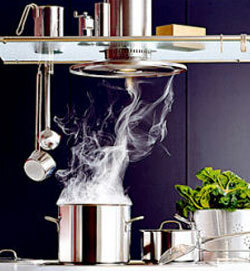 You have to remember that an updraft kitchen ventilation fan automatically becomes a key element of the kitchen design. It is imperative that you follow the indicated duct size that is recommended for your island kitchen ventilation fan. Some homeowners take this lightly and could not resist the temptation of using smaller ducts to cut cost. This can significantly reduce the rated capacity of your ventilation fan and increase the noise rating of your ventilation system. Make sure that you use ducting with the appropriate size and not go beyond the maximum length that is recommended for your kitchen ventilation solution. Aside from the features and technical specifications of the island kitchen ventilation fan, you also have to consider the fine prints of the warranty or guarantee that is provided by the manufacturer or distributor. Some of the notable brands that you can consider for your island kitchen ventilation fan include Broan, Fantech, Soreli, Jenn-Air, Air King, Sears and Ventilation Direct.